An aerial view of the three islands of Gili. Located just off the northwest coast of Lombok in Indonesia are the triplet islands namely; Gili Trawangan, Gili Meno and Gili Air – collectively referred to as the ‘Gilis’. Boasting of evergreen views surrounded by glistening blue waters and crystal-like sand, this place makes for an amazing vacation spot. It is a tourist hot-spot, and this is justifiable, as the Gili Islands provide a wide range of fun activities that goes beyond diving and snorkelling. There is so much to do here; be it for family vacations, honeymoons, personal time or even a wedding! The Gilis are always welcoming. 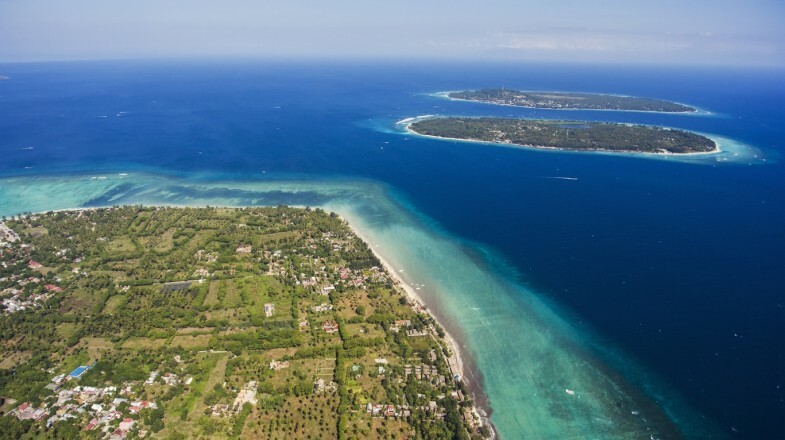 Best time to visit: The dry season between June and September is a lovely time to visit the Gilis, as the weather is very favourable and makes things like transportation easier and tolerable. It is also a good period for water activities. Minimal security is available on the islands as there are no active police forces. There's also minimum medical care available and it's limited to small clinics. The closest hospital is on Lombok Island. 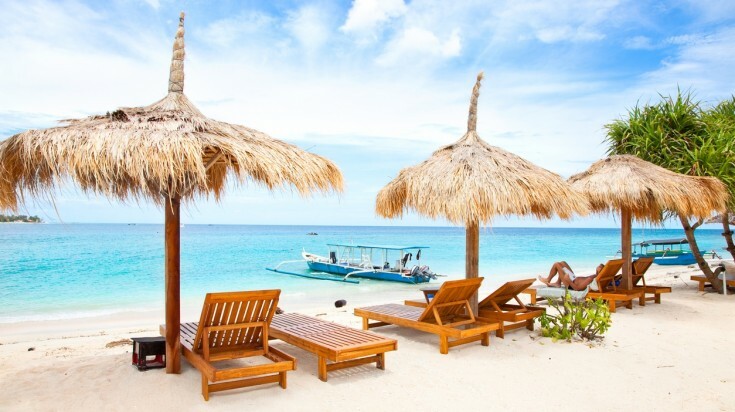 Relax on the white-sand beaches of the Gili Islands. Gili Trawangan is the largest of all three islands and expectedly the most toured of all; this is why it received the nickname ‘Party Island’ as it is hands down the most sophisticated and the best Gili island when compared to the other Gilis for partying. The island is endowed with more geographical space, littered with tons of classy restaurants, bars and hotels – food and accommodation are never an issue on the Trawangan. One notable feature of this island is its radical nightlife which gives off a castaway kind of vibe – for a better nightlife experience, head to the main shore within the port. While the port on the western coast gives off a rather solemn and serene vibe suitable for couples and those on honeymoon. Gili Meno is the island in the middle, and happens to be very quiet in comparison. It is a great spot to enjoy quality-alone time, thus making it splendid for lovers. The condition of the waters at Meno is great for divers; bonus points stemming from the underwater sculptures created by popular water sculptor, Jason de Caires Taylor. There are a few cafes, restaurants and bars on this island, however, the natural add-ons like the landscape, Seawater Lake, and flamingo’s in the Gili Meno Bird Park, makes up for this lack. Gili Air is the third of the islands and is known for its amazing beaches and exotic beach homes. It mixes the party-vibe of Gili Trawangan and the quiet, relaxed tone of Gili Meno to create a balance that’s just right. 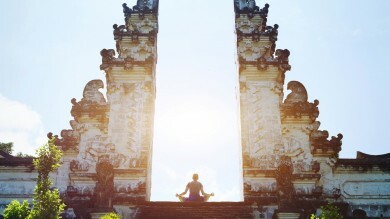 People love it here, mostly because it emits a very energetic aura, making it a spot-on getaway destination within a very short distance from the major hub, Lombok. This island is popular with families and backpackers and has a local vibe to it compared to the other two islands. Sea turtles can be easily spotted while diving. There are lots of seasoned professionals at the Gilis who would be more than thrilled to take you on an adventure of a lifetime (through Lombok to Gili Islands). Travel through Gili Island’s marine wildlife either on a snorkelling tour or scuba tour. There are lots to be seen and explored under the sea! You can go on a diving tour at sites on all three islands. Scuba diving and snorkelling will have you floating with the beautiful and attractive tropical fishes in no time, while feasting your eyes on colourful coral reefs and exploring old shipwrecks. Water activities like kayaking and banana boat rides can enrich the diving experience. You can also try riding in a traditional Indonesian boat called “Jukung” or set out on a captivating cave journey. Be captivated and inspired by the beauty of watching turtles in their natural habitat. The turtle sanctuary at Meno Island is made up of varying pools and bathtubs found on the beach. These are filled with loggerheads and baby green turtles. The turtles are nurtured here until they reach the age of 8 months before being released into the sea. 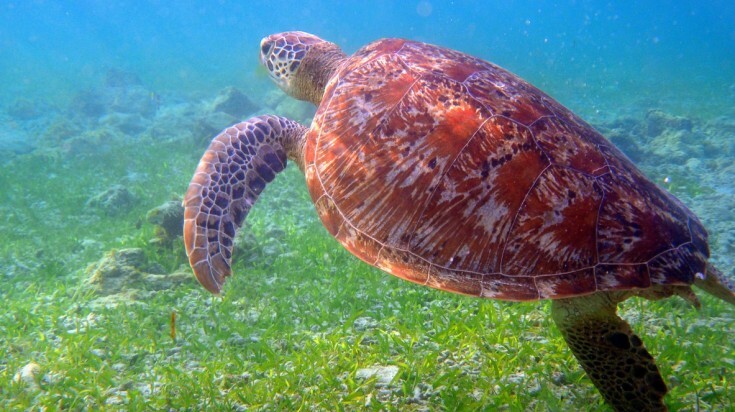 Going on a snorkel tour will guarantee you a first-hand view of these amazing turtles. Sunsets are stunning and colorful on the Gili Islands. The Gili Trawangan viewpoint refers to the highest point on the island which has fantastic views of the other Gili Islands, Mount Rinjani (located in Lombok) and Mount Agung (located in Bali). The viewpoint is located on the southern part of the island. Watching the sunset from such amazing height, makes for a special way to end a day at the Gili’s. No matter which one of the three Gili Islands you’re on, this is a fun activity to explore the islands’ coastlines. This activity is most suited for families and couples as it is best enjoyed in groups. Horse rides might not be the most traditional of activities, but while at the Gili Islands, this becomes a wonderful experience to just sit on a horse and thread along the lines of the waters while the sun sets on the horizon – seems cinematic and priceless! The market square located at the front of the boat pier on Gili Trawangan hosts a very diverse and interesting night market which kicks off by 6pm daily. This is something that cannot simply be ignored while on this Gili Island. You get to enjoy all sorts of local cuisines (mostly seafood) at a very considerable rate. 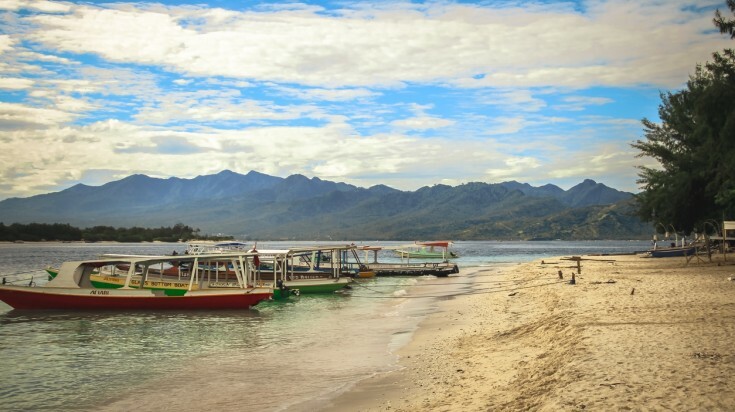 Go island hopping around Gili Islands on speed boats. You can move between the islands on a speedboat. Maps are put in place, mostly in the many kiosks littered on the island. This way, it won’t matter much if you have a Smartphone with GPS on it or not, as it is easy to trace back your steps. There are limited ATMs and most are not available all 24 hours. You can rent at bike to get around the island as there are no vehicles on the Gili Islands. While drinking, it is best to stick to pre-packaged drinks as drink spiking and methanol poisoning is a common occurence. Drugs are another problem on the islands, especially on Gili Trawangan. Indonesia has very strict drug laws, so stay away from any offers. Whether it’s beach parties, a romantic getaway or a family holiday, no matter which Gili Island you decide to visit, you will find nothing short of an exciting adventure that is catered to your needs. 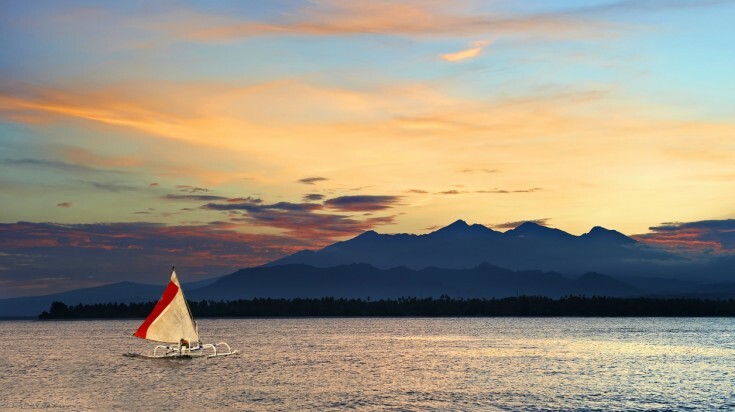 So which Gili Island is best suited for you?